It's a city of a million stories, and Broadway knows them all! 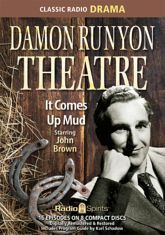 High rollers and low lifes, classy dames and shady dealers are in it for the laughs (and the payoff) in this collection of sixteen tales from the pen of Damon Runyon. John Brown stars as your narrator in these yarns of the Great White Way, along with Paul Dubov as homicide detective Johnny Brannigan (and a good many other characters). Join radio favorites Jack Webb, Ed Begley, Jeff Chandler, Alan Reed, Sheldon Leonard, and more for unusual bets, uncommonly good luck, and an unearthly meal at Mindy's.